The Apollo Ohm Go Kit is a starter kit which includes the 50 watt, 1900 mAh Ohm battery and a 3ml Portal tank. 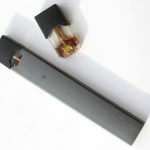 The Ohm Go is design for first time Vapers transitioning from smoking or current Vapers seeking to upgrade from cig-a-likes and disposable ecigs. Available colors include black, stainless steel and white. A detailed review of the Ohm Go kit. The Apollo Ohm Go kit comes with a 1900 mAh battery, a 3ml top fill Portal tank, two coils and a USB charger. The green light indicates the Ohm Go battery is fully charged. The Ohm battery is a 50 watt, eGo style battery that is rated at 1900 mAh. The battery is self-adjusting. As the battery drains, the 50 watt power supply is reduced. The battery will fire as low as 5 watts. It has 510 threading and spring loaded to handle various other tanks. It can fire coils with a resistance as low as 0.3Ω. This is an internal battery that cannot be replaced. As an added safety feature, there are four ventilation holes at the base of the battery case. The battery strength was rated as decent, but a 2500 to 3000 mAh battery option would be ideal. The battery case is surrounded by a laminate that resembles rubber. It is more than an aesthetic feature, since it also reduces the number of nicks and scratches the battery may receive in every day use. A Micro USB port to charge the device is located on the side of the battery and it is pass-through enabled. This means a Vaper can still use the device as it is charging. To turn the battery on or off, simply click the firing button five times quickly. The frame surrounding the fire button on the battery provides the user information on the battery strength. Green – Battery has an adequate charge. Blue – Battery is approximately half charged. Blinking Red – Battery is dead and the device will not fire. The Portal Tank is a top fill design and holds 3ml of vape juice. The Portal Tank holds 3ml of vape juice. It is a top fill design so it’s easy to refill the tank when the juice runs low. The Portal tank includes an adjustable airflow located on the base of the tank which allows the user to adjust the ease of draw. Unscrew the base the of tank to add or replace a coil. The inner chimney of the Portal tank attached directly to the coil. This allows the vapor produced by the coil to have a direct path to the mouthpiece for inhalation. A great feature of this tank is the outer metal shell that surrounds the glass tank. This will come in handy if the tank is accidentally dropped. The metal shell may prevent the glass from breaking when it hits the ground. 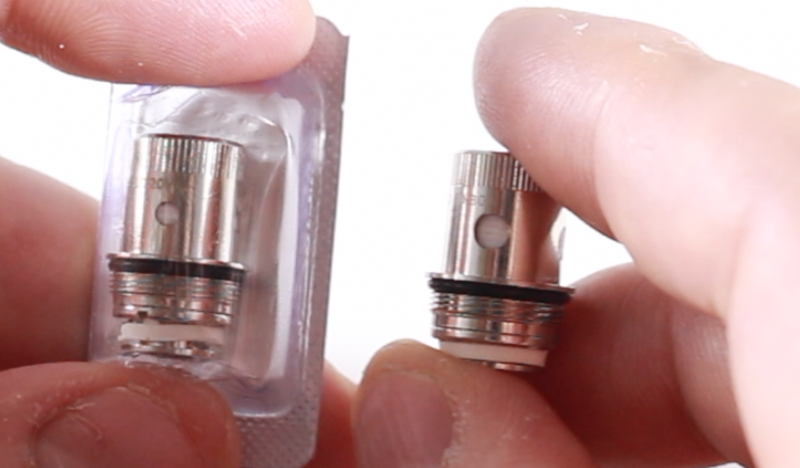 The kit includes a 1.0 ohm coil (L) and a pre-installed 0.5 ohm coil (R). There are two coils that come with the kit. The first coil is a 1.0Ω and designed for Mouth to Lung vaping. This coil is best used for vapers using a high PG vape juice and more interested in flavor than vapor. 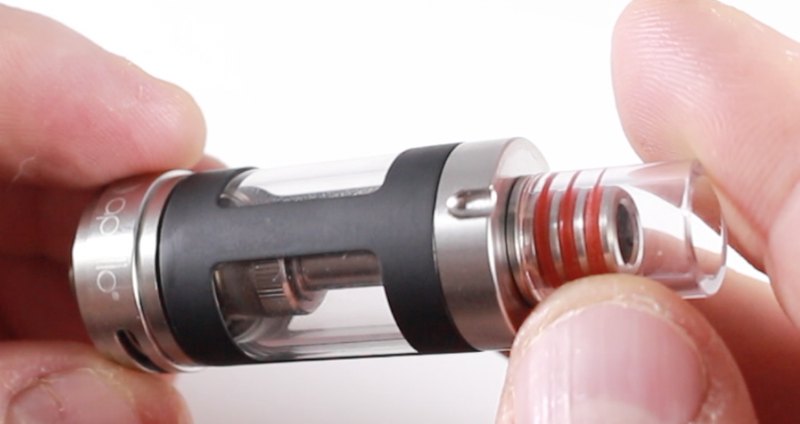 The second coil is 0.5Ω which is designed for Direct Lung vaping and is already pre-installed in the Portal tank. Its juice holes are approximately twice the diameter of the 1.0Ω. This coil is ideal for larger, dense clouds with a slight reduction of flavor. Vapers can purchase replacement coils in packs of 5 here. For Cloud Chasers, there is also an option for 0.3Ω than will produce even more dense clouds than the 0.5Ω. Unfortunately, this coil is not included in the kit. The Ohm Go by Apollo e Cig is a vape pen perfect for smokers wishing to switch to vaping or to upgrade from cig-a-likes. It is easy to use and hassle free.